This entry was posted in Holidays and tagged New Year's Day, Rose Parade, Tournment of Roses Parade. Bookmark the permalink. 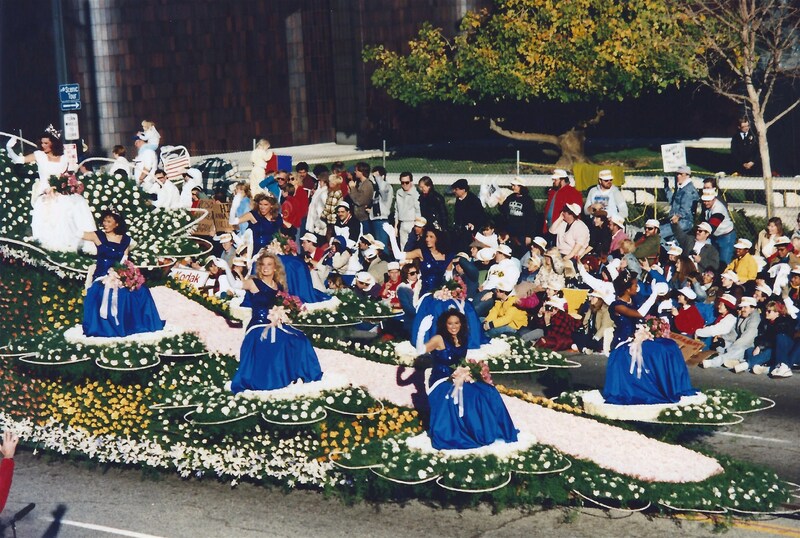 Seeing the Rose Parade in person was one of the first things I did on moving to Los Angeles, and I didn’t mind the cold or catching only a few zzzz’s in the early morning hours. I did so a couple other times but have no stories with flare or flares. At this point watching it on television while curled up in a throw on the couch is my preferred location. Watching on TV has a couple of big advantages: Parking is easier, and a bathroom is nearby (with no long line). Still, I think you’d agree that seeing the parade in person is a memorable experience. Thanks for your comment, Herb. Too soon old, too late smart. And just to set the record straight, I have never played with a flare since. Me either, Bob. I’ve done other dumb things in the last 50 years or so, but I’ve avoided repeating that particular one. Love this story. I remember a bunch of us going down and spending the night just like these boys but without the flare. Thanks for bringing back some good memories. It’s a popular thing to do — the attendance along the parade route is usually estimated in the hundreds of thousands. As you know, it gets pretty chilly by 4 a.m. or so, but in most years skies are clear when the sun rises and it makes for a beautiful day. I think we have all set a friend on fire. Thanks, Rick. I feel better now. My experience with the Rose Parade: I had just moved here from Montana and had scored a great “break in the business job” as a page at KTTV. My page supervisor asked for volunteers to work the parade. It was a cool assignment, but you had to give up New Year’s Eve because you had to be at work in Pasadena at 11:30pm and work through the night until the parade was over. Everyone warned me that it would be really cold, but come on, I was from Montana. My small concession to their warnings was a sweater vest under my wonderfully tasteful burgundy polyester page uniform blazer. Well, I’ve been cold before, but as the temperature in Pasadena hovered around 28 degrees that night, I thought I had never been that cold in my life. I spent every second I could warming myself at the exhaust of the production truck. I’m surprised I didn’t pass out from carbon monoxide poisoning. My first and only experience of in person attendance at the Rose Parade. You’re not kidding about that California cold, Jeff — and imagine what it must be like for the baton twirlers in their skimpy outfits as they wait for the parade to form up. From what I’ve heard, the only people who are sweating in those predawn hours are the float drivers, who are in a tiny compartment next to a couple of V8 engines. Thanks for sharing your story. You certainly do have a flare for the dramatic, Tom. Count me among ’em who has chosen to spend a night in the gutter, and for two of the very best: Pasadena/Roses and NYC/Macy’s. As someone who’s always considered himself game for just about anything, happy I did. Now, equally happy to be a member of the “One and Done” Club. Well, Reed, I’m not sure you were in the appropriately festive frame of mind if you refer to it as spending “a night in the gutter”. Those are two of the country’s best parades, as you noted, and if you care to reconsider your “One-and-Done” Club membership, New York’s St. Patrick’s Day parade will be here before you know it. You don’t even have to get up early — it goes pretty much all day. Thus was born the celebration known as Burning Man. Hm, I hadn’t thought of that, Gary. At the very least, it was Smoldering Man. Love St. Paddy’s! And Columbus Day (More a celebration of Italian-American culture than a paean to ol’ Chris). As well as Puerto Rican and Dominican Days. As you know, NYC loves a good parade, and we seem to look for any excuse to throw one! Years ago I watched an impressive Halloween parade in New York (SoHo, maybe?). The best place to experience Halloween in NYC, though, is on the subway, where the cars are full of superheroes, ghosts, witches, and cartoon characters.